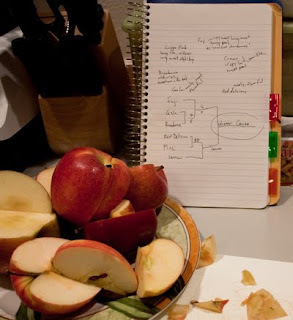 We really like apples, B likes Fuji's, I like Braeburn. In the spirit of March Madness, we taste tested to see which apple comes out on top, tournament style. Organic players were available from PCC Market. 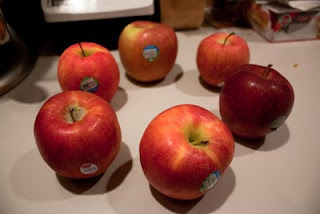 Starting from the top going clockwise, Fuji, Cameo, Red Delicious, Gala, Braeburn, Cripps Pink. Order was selected at random. Fuji and Gala apples were early favorites, but Cameo quickly dominated the pile with its crispy texture, almost pear-like flavor and sweet peel. The difference was very apparent when tasted side by side. Some were crisp, others mealy. Sweetness was sometimes in the peel, or otherwise in the flesh. There are different apples available at different seasons, notably in the fall. Hopefully we'll do this again. Mackintosh and Pippin are a couple that we hope to join in next time.